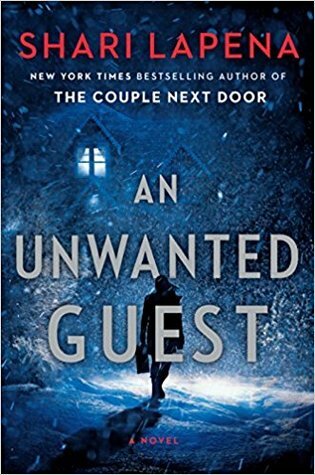 Today I'm featuring a recent read, An Unwanted Guest by Shari Lapena. The excerpts shared are from a hardcover version borrowed from the library. The road curves and twists unexpectedly as it leads higher and deeper into the Catskill Mountains, as if the farther you get from civilization, the more uncertain the path. The shadows are deepening, the weather worsening. Page 56: Gwen knows she's being reckless but she doesn't care. Something has happened to her, and she's opening herself up to it. My thoughts: This is the kind of book that hooks you from the start, drawing you in to curl up for one long reading session or over a weekend. In An Unwanted Guest, couples checking in at Mitchell's Inn for a weekend retreat in a remote upstate New York location get more than they bargained for. As a snow storm and power outage isolate guests from the outer world, they quickly realize that there is a killer in their midst. Who is responsible for the deaths of several of the guests? What is the motive and why have these individuals been singled out? Reminiscent of Agatha Christie's And Then There Were None, Lapena crafts a taut, suspenseful tale with red herrings aplenty that keeps readers guessing until the final chapters. Moreover, even after the murderer is exposed, the author throws in an unexpected twist for good measure. From Goodreads: A remote lodge in upstate New York is the perfect getaway. . . until the bodies start piling up. It's winter in the Catskills and the weather outside is frightful. But Mitchell's Inn is so delightful! The cozy lodge nestled deep in the woods is perfect for a relaxing--maybe even romantic--weekend away. The Inn boasts spacious old rooms with huge wood-burning fireplaces, a well-stocked wine cellar, and opportunities for cross-country skiing, snowshoeing, or just curling up with a book and someone you love. So when the weather takes a turn for the worse, and a blizzard cuts off the electricity--and all contact with the outside world--the guests settle in for the long haul. The power's down but they've got candles, blankets, and wood--a genuine rustic experience! Soon, though, a body turns up--surely an accident. When a second body appears, they start to panic. Then they find a third body. Within the snowed-in paradise, something--or someone--is picking off the guests one by one. They can't leave, and with no cell service, there's no prospect of getting the police in until the weather loosens its icy grip. The weekend getaway has turned deadly. For some couples, it's their first time away. For others, it will be their last. And there's nothing they can do about it but huddle down and hope they can survive the storm. This book looks interesting. Enjoy your current read! Very intriguing, love that vivid and descriptive beginning! Happy weekend! Oh, yes, another book I loved! Kept me glued to the pages. Thanks for sharing, and for visiting my blog. Sounds like a book to read in bright daylight - and a locked house. I'm featuring The Military Wife by Laura Trentham from my review stack this week. Happy reading! Although being bundled up in an Inn sounds nice (well, until the murders start), I'm thinking warm beaches and sunshine right now. You're right. I'm hooked already by the cover, title and the excerpts! I really like the sound of this one! My next book is going to be a psychological thriller, and I can't wait. Thank you for sharing, Catherine. Have a great weekend. This has been on my TBR! It looks so good! This is one of my wishlist books and I really wanted to read it a couple of months ago. Not sure how I lost track of it. And I would probably find interest in it at the least because we lived for a couple of years on the edge of the Catskill Mts. in the Hudson Valley region. Yes, it got cold and snowy there!